Your broker may decide to send your order to another division of your broker's firm to be filled out of the firm's own inventory. This is called "internalization". In this way, your broker's firm may make money on the "spread" - which is the difference between the purchase price and the sale price. Here's an example of how price improvement can work: Let's say you enter a market order to sell 500 shares of a stock. The current quote is $20. 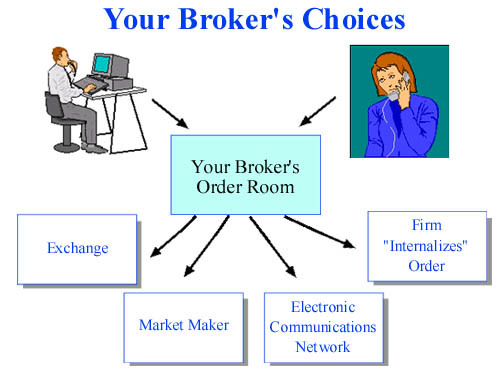 Your broker may be able to send your order to a market or a market maker where your order would have the possibility of getting a price better than $20. If your order is executed at $20 1/16, you would receive $10,031.25 for the sale of your stock - $31.25 more than if your broker had only been able to get the current quote for you. If for any reason you want to direct your trade to a particular exchange, market maker, or ECN, you may be able to call your broker and ask him or her to do this. But some brokers may charge for that service. Some brokers now offer active traders the ability to direct orders in Nasdaq stocks to the market maker or ECN of their choice. In a recent speech, SEC Chairman Arthur Levitt emphasized that investors have the right to know where and how their firms execute their orders and what steps they take to assure best execution. Ask your broker about the firm's policies on payment for order flow, internalization, or other routing practices - or look for that information in your new account agreement. You can also write to your broker to find out the nature and source of any payment for order flow it may have received for a particular order.